Memphis Soul Review Christmas Party feat. Johnny G & The E Types | Sat Dec 20 2014 | SOUL OF SYDNEY FEEL-GOOD FUNK SOUL DISCO vibes & beyond. 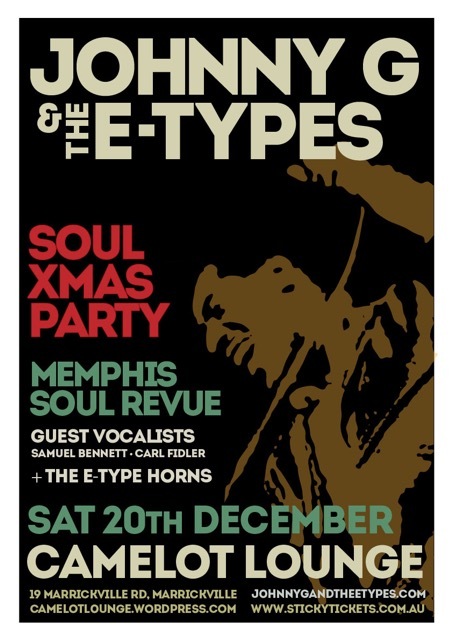 Our good friends Memphis Soul Revue take over Camelot Lounge later December for the MEMPHIS SOUL REVIEW CHRISTMAS PARTY. This years event features Johnny G 7 The E types with guest vocals from Samuel Bennett, Carl Fidler and more.